Interview with Suzann Pileggi Pawelski, MAPP, and James Pawelski, Ph.D.
Home Positive Psychology and Coaching Interviews Interview with Suzann Pileggi Pawelski, MAPP, and James Pawelski, Ph.D.
On January 26, 2018, we had a Q&A interview with Suzie Pileggi, MAPP, and James Pawelski, PhD, to talk about their new book, Happy Together: Using the Science of Positive Psychology to Build Love that Lasts. Suzie is a freelance writer and wellbeing consultant. James co-founded the Master of Applied Positive Psychology Program with Marty Seligman and is now Director of Education and a Senior Scholar in the Positive Psychology Center at the University of Pennsylvania. 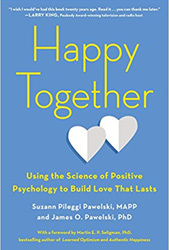 Eagerly anticipated, Happy Together is the first book on using the principles of positive psychology to create thriving romantic relationships. Combining extensive scientific research and real-life examples, this book will help you find and feed the good in yourself and your partner. TO RECEIVE THE RECORDING, fill out the form below. You’ll also receive a complimentary subscription to Ben’s monthly email newsletter, The Coaching Toward Happiness News. And please know your email address is safe with us. We will not share or sell your email address or personal information to any person, organization, or third party. Includes easy-to-follow methods and exercises to help you learn to strengthen your partnership, whether you’re looking to start a relationship off on the right foot, weather difficult times, reignite passion, or transform a good marriage into a great one. Suzann (“Suzie”) Pileggi Pawelski has a Master of Applied Positive Psychology degree from the University of Pennsylvania. She is a freelance writer and well-being consultant specializing in the science of happiness and its effects on relationships and health. Her 2010 Scientific American Mind cover story, “The Happy Couple,” was the catalyst for this book. Suzie writes the “Science of Well-being” column for Live Happy, where she is also a contributing editor. 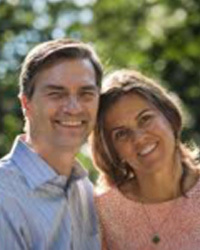 She has given “Romance and Research” (TM) workshops around the world with her husband James. Previously, she directed award-winning media relations campaigns for Fortune 500 clients, worked in publicity at Radio City Music Hall and was an associate producer for HBO Downtown Productions and The Joan Rivers Show. James Pawelski, PhD, is Professor of Practice and Director of Education in the Positive Psychology Center at the University of Pennsylvania where he co-founded the Master of Applied Positive Psychology Program with Martin Seligman. The Founding Executive Director of IPPA, he is currently leading a three-year, multi-million-dollar grant investigating connections between the science of well-being and the arts and humanities. An international keynote speaker, he has presented in more than 20 countries on 6 continents, including “Romance and Research” (TM) workshops with his wife Suzie. He is frequently featured in the media, including the New York Times, U.S. News and World Report, Philadelphia Inquirer, and The Today Show.